It wasn't that long ago now that we played a rather strange game called Pooper Scooper, in which the object of the game was to clean a park using different characters with different abilities such as a worm to eat weeds and even a beetle to clean up poo. 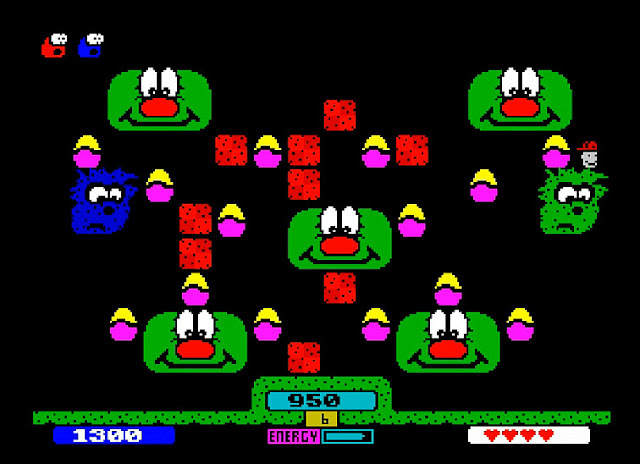 Well it seems as if the team behind that game were not finished with this strange style, as this month Death Squad released for the ZX Spectrum 'The Eggsterminator'; a game whereby you need to use one of those characters from the previous game to clean up poisonous snake eggs. Now if you've played the previous game then you know what to expect with this one, but if you haven't, all you have to do is to use your little man character and punch all the eggs as fast as possible before the time runs out. But beware although you can punch the menacing creatures walking about the game, they will damage you and if enough damage is done it's a life lost! Sound fun? Yes it is, as thankfully the game is full of enjoyment and it's every bit as good as Pooper Scooper and even more so with a great soundtrack by Yerzmyey.